Offers a wide range of signalling options in a zinc alloy fully enclosed corrosion resistant case. Available for direct mounting onto Kinetrol rotary actuators, or discrete mounting via an industry standard VDI/VDE interface onto any make of rotary actuator. Easy to wire and set up with real industrial quality robustness. Internally fitted options include AS Interface digital communication and a 4-20mA 2-wire modulating angle retransmit circuit. 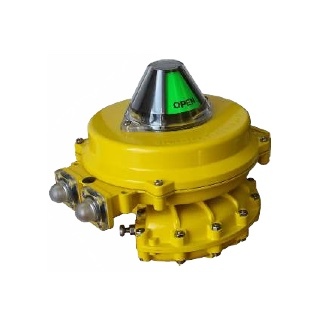 The range of switch and terminal arrangements includes 2 or 4 switches, extra connections allowing single point termination of wiring for limit switches and solenoid valves, ATEX approved Eexed (Category 2) explosion proof and Eexia intrinsically safe packages (Category 1). Integral sealed Clear Cone Monitor and red/green Led indicator options also give excellent external visual indication of position.